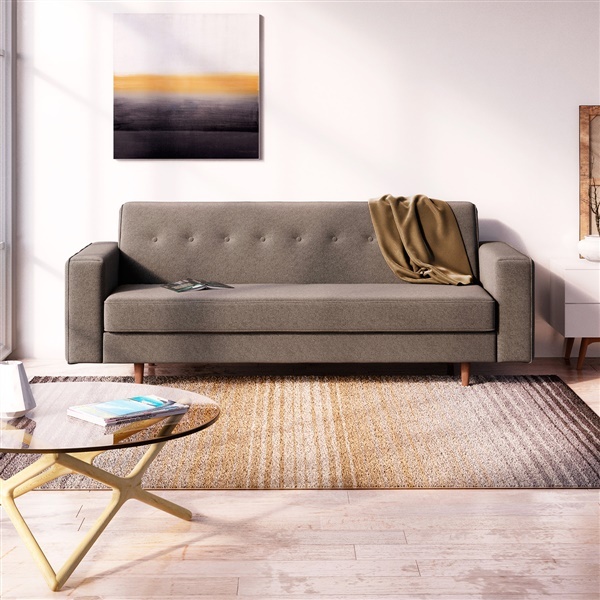 Featuring that famed simple sophistication of Scandinavian inspiration,the Taylor Sofa is ideal for the crisp, clean character of an understated contemporary area or a motif with a hint of mid-century flair. Long and lean yet lush, the Taylor Sofa also offers classic comfort with an interior of memory foam. In your choice of fabric color options, each expertly adorned with just the right touch of button-tufted detail against its clean-lined silhouette, the Taylor Sofa is the ultimate in low-key luxury. Versatile modern style with mid-century influence. The simplicity of the design calls for some fun experimentation when it comes to decor - I can't wait to start adding some quirkiness to the mix! I ordered in charcoal gray and I could easily add bright accents with it, yellow, white with touches of a similar gray made my living room look like a model in a design studio - it's truly perfect! The Taylor sofa is simple in style and I got it in the lime green color to add a wow factor to my space. Have zero complaints. Works great in my space, priced very competitively, comes in great color variety. ProsEvery single thing about this sofa is a pro! Purchase in charcoal gray. Great sofa. Very happy. Good price and quick delivery. Seat height and seat depth? The seat height is 18.25" and the seat depth is 21.75".